Because quite simply, a lot of customers prefer to call to either get more information before they buy, or to purchase a service offline. While these types of customer interactions are not counted as ‘clicks’ in an Adwords campaign, and therefore not contributed to Google advertising, they should. As most all small business owners are aware, phone calls tend to be the best type of customer lead, and ignoring how one gets such calls is leading to skewed statistics on Adwords reporting. But if clicks from ads lead to landing pages, which then have a phone number that some customers will dial – then how does one know which Google ad caused the sale? Just looking at the Google ad console will not tell you anything about if someone called – only if someone clicked or purchased online. But what about the offline orders that come through the phones? How does one measure that sales activity to their Adwords campaign? The simple answer – toll free numbers. And get a handful of them, at least. 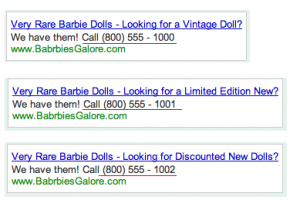 Here’s how to set them up with your Adwords campaign. 1) Grab the right amount of toll free numbers that match your campaign types. 2) Place them on your landing pages. 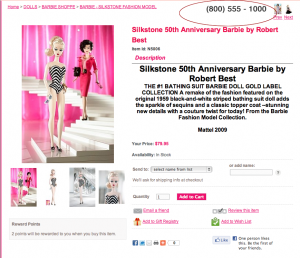 BarbiesGalore has three main ad groups in Adwords – Vintage dolls (lower traffic but higher per item price) Limited Edition (medium price but higher traffic) and New dolls (high traffic but lower per item price). Placing the right toll free number on the type of landing pages will make it easy to track which phone call sales are coming from which ads on Google. 3) Track and measure the activity of the toll free numbers. Try it! It’s a powerful way to get visibility into how you’re spending you’re money. After all, it’s your hard earned cash – why waste it?